Eggs Florentine is one of my favorite ways to jumpstart a day as it has two of my favorite things in the world: eggs and vegetables. I’ve blogged about Eggs Florentine before. It’s such a quick and easy dish to prepare! This is a dish that can be done in 10 minutes flat. That includes prep time too! All you need is a heated pan, olive oil, a pack of spinach, two eggs, onions, garlic and whatever other protein you want to throw in. Sometimes we use bacon, other times we use tuna flakes. I think this would be really good with beef strips too, but I haven’t tried that yet! Timer starts now: Pour oil on a heated pan. Saute bacon/tuna/your choice of meaty protein. Slide in onions and garlic and stir. Add spinach and cook for about 2 minutes. Crack 2 eggs over the spinach. Season with salt and pepper. Cover to let steam cook the eggs. Sprinkle with Parmesan cheese before serving. DONE. I like bringing the pan over to the dining table and just setting it on a trivet. Sometimes there are already eggs cooked sunny side up when I walk into the kitchen. 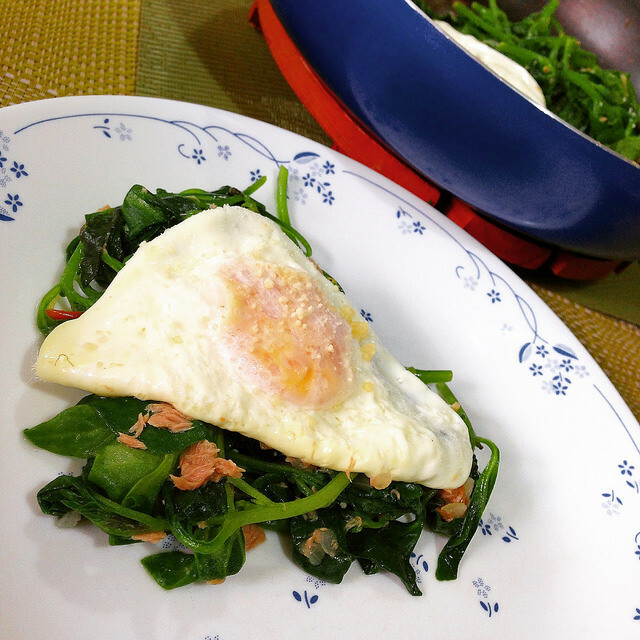 I do the same recipe anyway, but top the spinach with the cooked eggs before serving instead. It’s still yummy! What’s your recipe for Eggs Florentine? Come share! If you have a favorite breakfast recipe that involves eggs AND veggies, please share it in the comments! I’m looking for other ways to enjoy veggies during breakfast.